ESP® monitors driving stability and traction. Traction is the power transmission between the tires and the road surface. lamp in the instrument cluster lights up continuously when the engine is running. Observe the information on warning lamps and any display messages that appear in the instrument cluster . ► Do not deactivate ESP® under any circumstances. ► Only depress the accelerator pedal as far as necessary when pulling away. ► Adapt your driving style to suit the prevailing road and weather conditions. ► If appropriate for the driving conditions, engage the LOW RANGE off-road gear . At speeds above approximately 37 mph (60 km/h), traction control is no longer active. 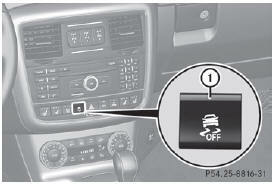 the ECO start/stop function automatically switches the engine off when the vehicle comes to a stop. The engine starts automatically when the driver wants to pull away again. ESP® remains in its previously selected status. Example: if ESP® was deactivated before the engine was switched off, ESP® remains deactivated when the engine is switched on again. If you deactivate ESP®: • ESP® no longer improves driving stability. • traction control is still activated. • and are driving at above 37 mph (60 km/h), ESP® still intervenes when one wheel reaches its grip limit even though it is switched off. If ESP® is deactivated, it is automatically reactivated when you drive faster than 37 mph (60 km/h) or if a predefined lateral acceleration threshold has been exceeded.